To become certified to teach reading in the USA, applicants need more than a degree in education. Most states rely on the Educational Testing Service (ETS) Praxis 5204 exam to assess the expertise of aspiring reading teachers. Test takers include new college graduates whose course work emphasized reading instruction as well as experienced educators who seek an additional certification in reading. 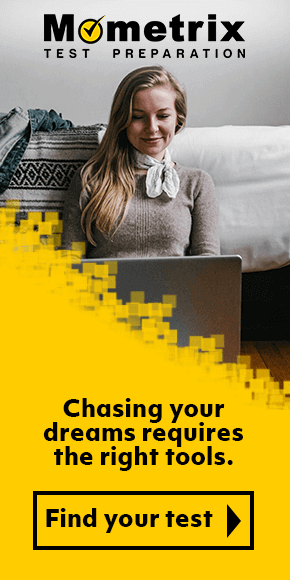 How do I register to take the Praxis II 5204? 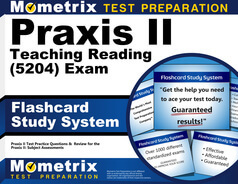 The first step in scheduling the Praxis II Teaching Reading exam is to make sure you need to take it. Check with your college’s education department or state board of education to see if you are required to take the Praxis 5204 for reading certification and, if so, what your state considers a passing score. The ETS website also lists the states that require the 5204 Praxis II test for reading certification. If you are required to take the Praxis reading exam, the ETS website will guide you through the registration process. There is a $146 fee for test administration. Test takers seeking accommodations for physical or visual disabilities or for non-native speakers of English can apply for additional testing time or other arrangements on the ETS website. Be prepared to document disabilities and explain the accommodations desired. When and where is the Praxis II 5204 offered? ETS makes their computerized tests regularly available throughout the year at a variety of locations, including college and university campuses. The ETS website allows you to choose a convenient date and site when you register online for the Teaching Reading exam. What is the testing situation like? Praxis exams are computer-delivered. Testing centers are quiet and carefully monitored. The only items a test taker may bring to a Praxis test are a photo ID and car keys. Pencils or pens, scratch paper, cell phones, calculators, and personal items should be left in a vehicle. How much time do I have to complete the Praxis II Reading exam? The 5204 test consists of 90 multiple choice and three essay questions to be completed in two hours. When will I learn my score? The Reading test is computerized, so the objective questions are scored immediately. The three essay questions may take up to three weeks to evaluate. ETS sends the final exam score to the test taker and to the state certification agency. 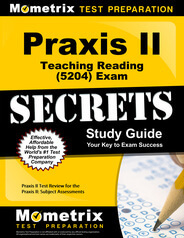 What does the Praxis II Teaching Reading exam cover? How should I study for the Teaching Reading test? The best way to study for a Praxis II exam to assess your strengths and weaknesses, practice answering questions similar to those on the test, and memorize the right answers. Mometrix exam preparation materials guide you from start to finish on your path to achieve your goal of becoming a certified reading teacher. First of all, how do you think you would perform if you took the Praxis Teaching Reading test today? You can find out free of charge by seeing how you do on the Mometrix Academy’s Praxis II Teaching Reading (5204) Practice Test. The Praxis II measures the content you want to teach. You can’t afford a hit or miss approach to preparation. After taking the Praxis II 5024 practice test, you probably know you need to study. But with so much content to review, where do you start? The Mometrix Praxis II 5024 Study Guide puts the likely test questions and answers in your lap. The Guide is a booklet, available in print or PDF downloadable form, which includes a strategy to control test anxiety, advice on when and how to guess on difficult questions, and hints on crafting responses to essay prompts. No plan to ace the Praxis II 5024 test would be complete without Mometrix’s Flashcard Secrets. The cards fit into your coat pocket or glove compartment. Take them with you to study anywhere, anytime, and watch your problems with recalling key terms, definitions, theories, and applications fade away. Next thing you know, you will be using flashcards to teach your students how to study for vocabulary tests! Mometrix Academy is a completely free resource provided by Mometrix Test Preparation. 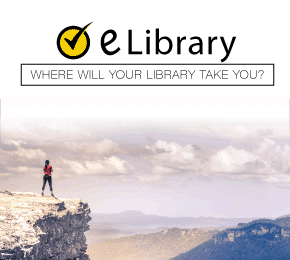 If you find benefit from our efforts here, check out our premium quality Praxis II Teaching Reading (5204) study guide to take your studying to the next level. Just click the Praxis II Teaching Reading (5204) study guide link below. Your purchase also helps us make even more great, free content for test-takers.